Creative Cloud has announced their 2015 update to Adobe products and among them is a cool update to the local tools in Lightroom. I’m talking about one of my favorite new tools, “Dehaze.” For the past few months, this tool has been a global tool residing in the “Effects” module (where it can still be found). But now, it can also be found under the “adjustment brush” in the local tools module. 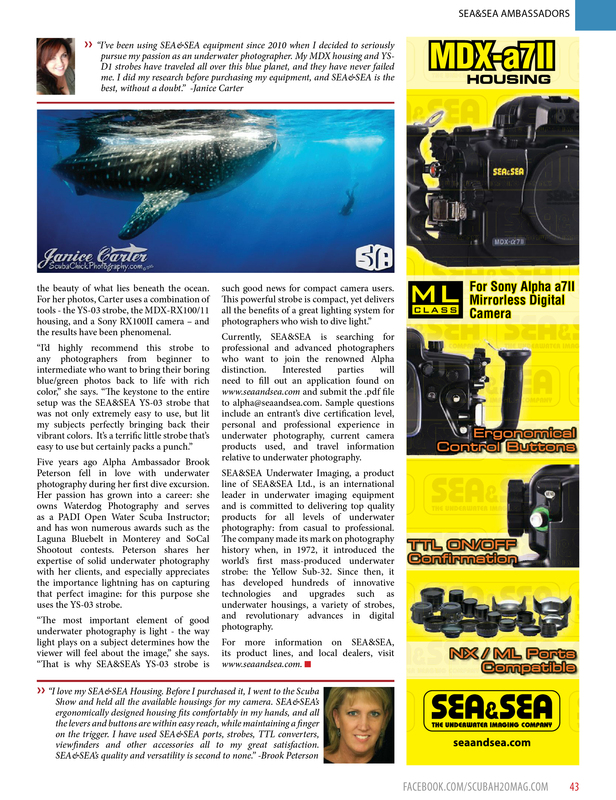 For a video tutorial of how to use some of the local tools for underwater photography, click on the image below. It is no secret that I enjoy photographing the little things. This hydro-sapien loves being able to see and share, the almost microscopic world that exists under water, with land dwellers. I have a deep appreciation for all creatures, and so, as I have been contemplating how to share some of the tiny critters I recently encountered, Cecil Frances Alexander’s words keep coming to mind. 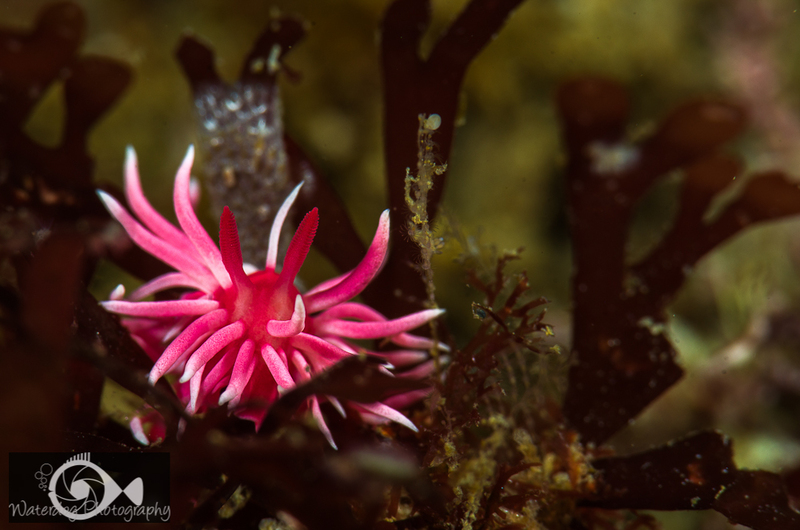 “All things bright and beautiful, All creatures great and small” immediately brings to mind the fabulous nudibranchs that I search for on every dive. Lately, in California, we have seen a scarcity of these critters. 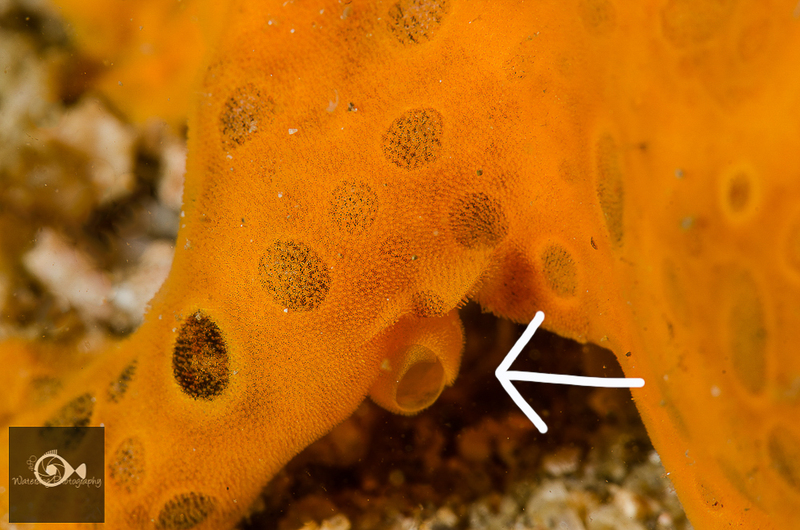 In the past few weeks, however, I have seen lots of nudibranch eggs, and lots of tiny nudibranchs. 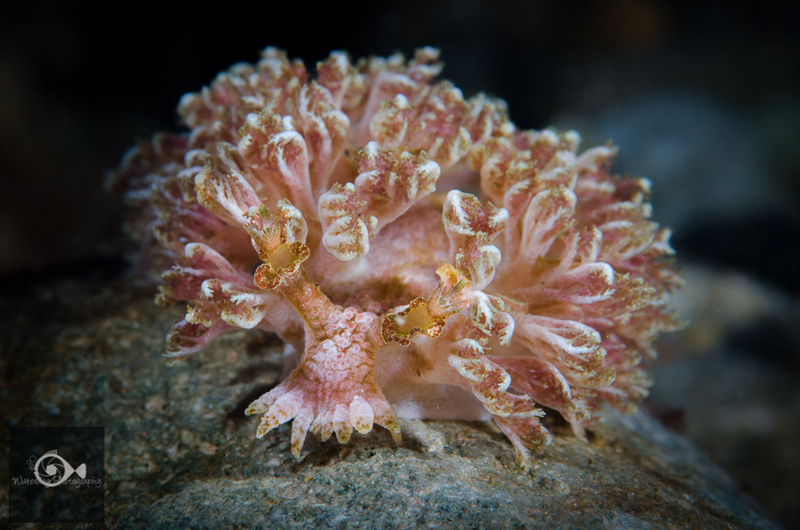 The image above is of a Hopkins Rose (Okenia rosacea, a nudibranch measuring about 1cm. It is not the most common, but I definitely think it is one of the most beautiful. 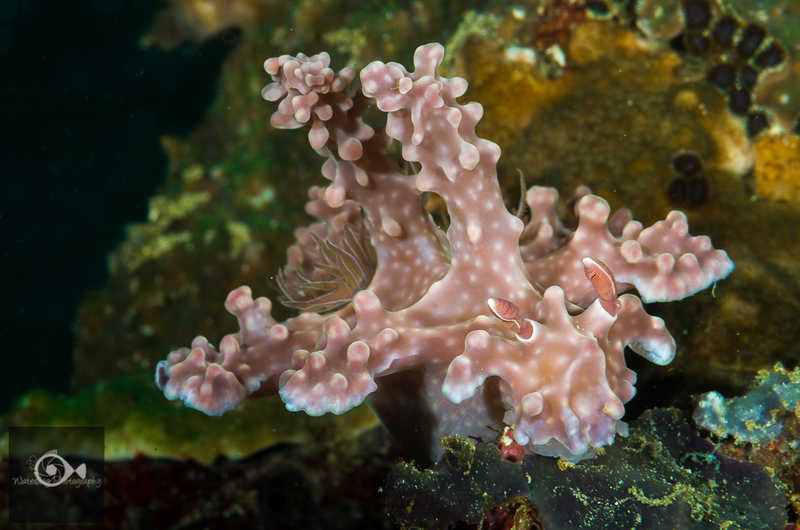 Below is a Porter’s Chromodorid (Mexichromis porterae about 2cm long). 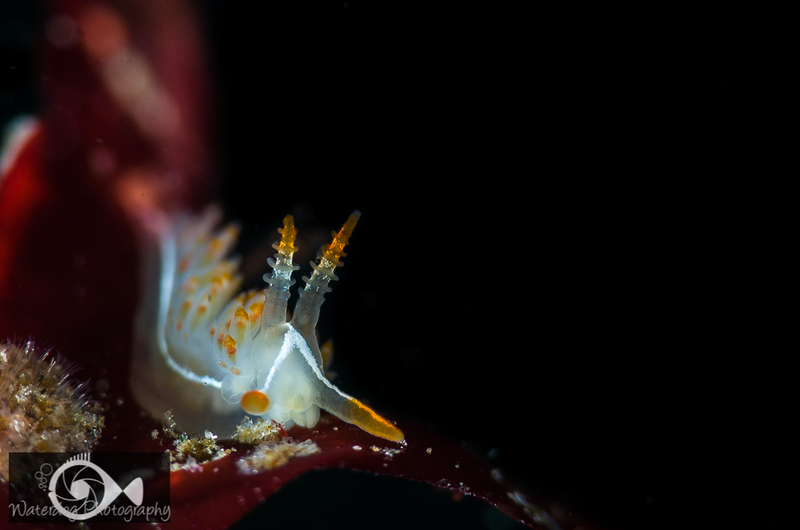 Since there are many very small nudibranchs right now, I have mostly photographed critters less than 1cm. 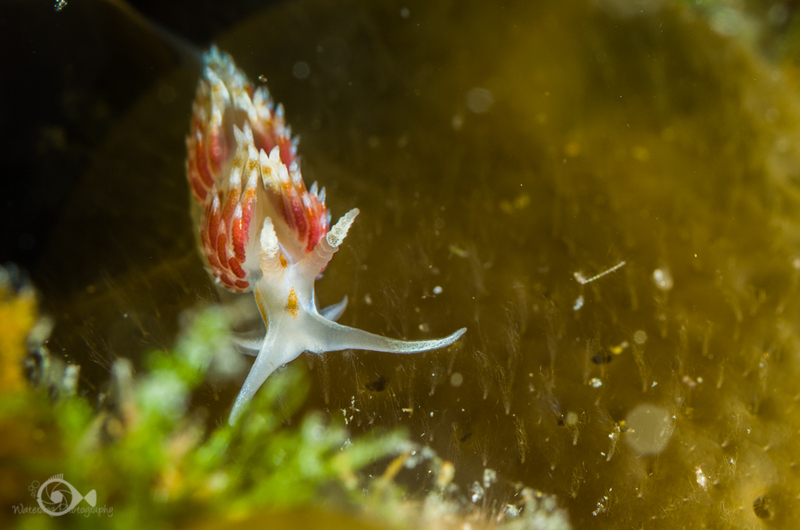 This tiny Three -lined Aeolid (Flabellina trilineata) was only 5 or 6 millimeters long. And its look-alike cousin, the Horned Aeolid (Hermissendra crassicornis,) was about the same size, although both species can get up to 36mm or larger. 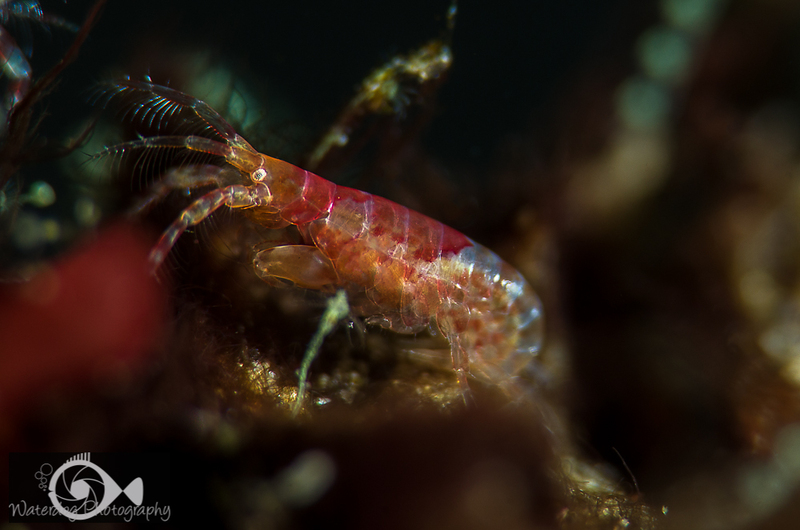 And on an even smaller scale, I have spent a good amount of time looking through the seaweed for isopods and larvae. This tiny critter is just a few millimeters. 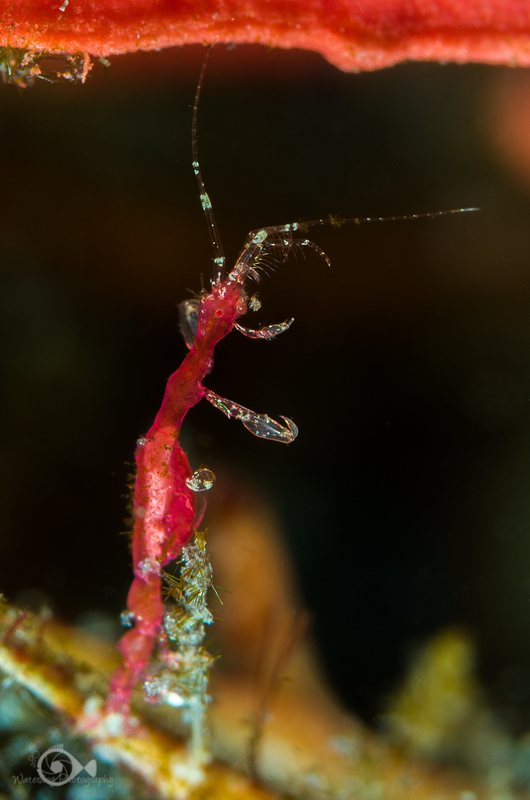 Some of my favorites are the skeleton shrimp, isopods that aren’t really shrimp, but bear the nickname because of their hilarious antics and the way they move around. They look like animated skeletons. 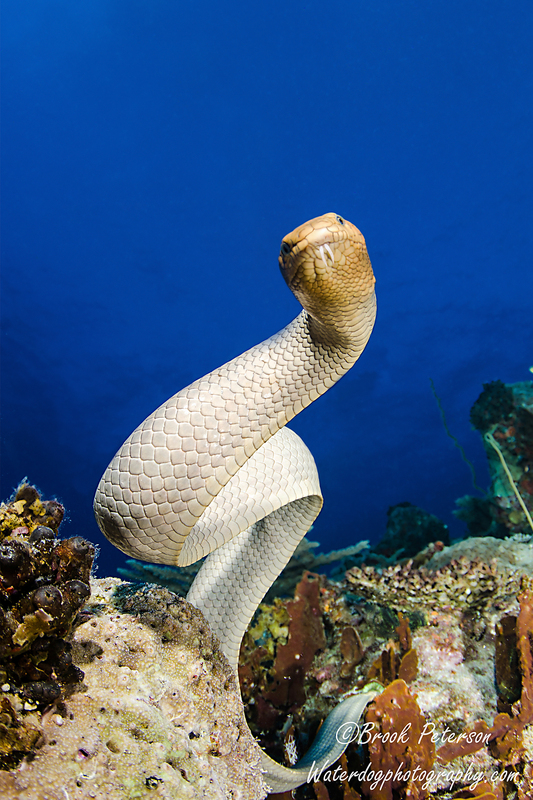 This one is pregnant with eggs, and when they hatch, the babies will cling to her body until they are nearly half her size. You may have to look closely to see them in the image below; Momma is covered with her offspring clinging to her antenea, back, jaw, and every other appendage. 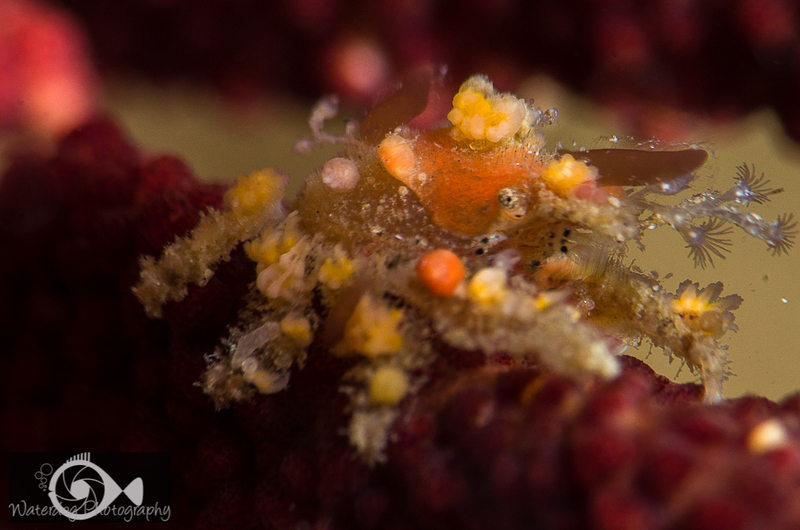 Another fun find for me this week was a family of decorator crabs. They were very hard to photograph because of the movement of the water, and all the fish that were desperately trying to take a bite of them while I exposed them to the camera. 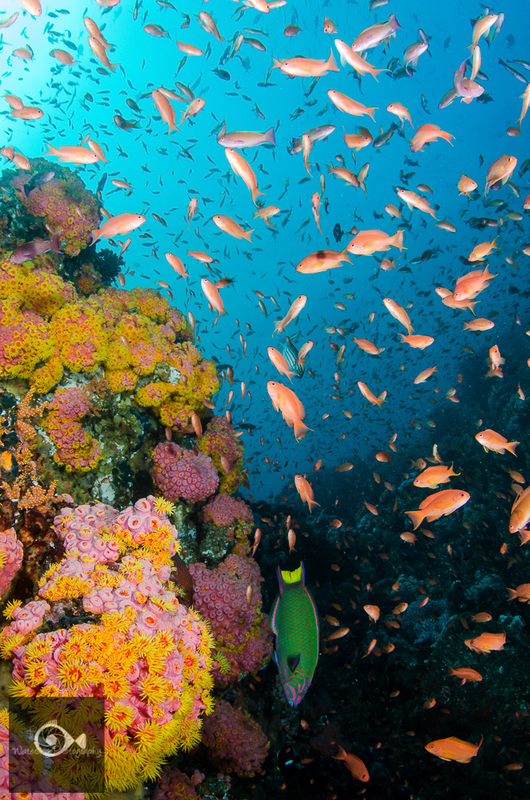 They are covered in all kinds of growth such as sponges, anemones and hydroids. You can see the one below if you look for it’s eye which is about a third of the way down and a third of the way over from the right. It looks like it has a long nose made of a white flowering plant with a brown leaf. This one was less than a square centimeter. 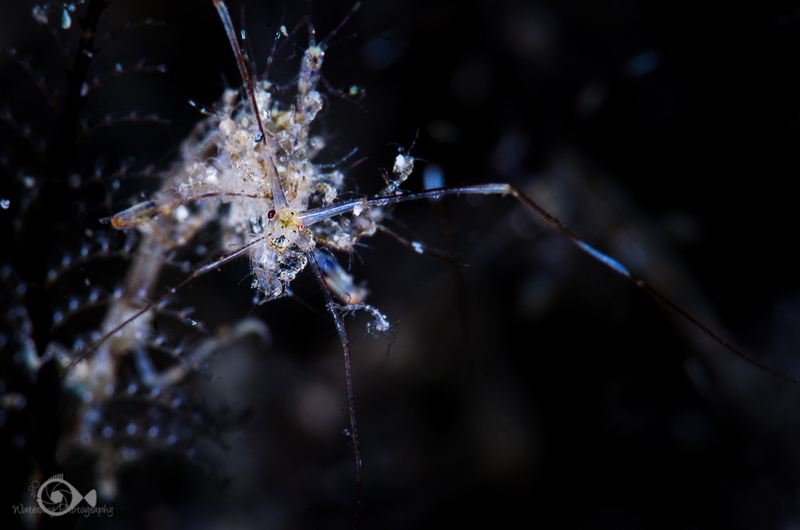 With the exception of the skeleton shrimp with all her babies, all these images were taken in the last few weeks in California. The ocean is coming alive again after several months of quiet time. 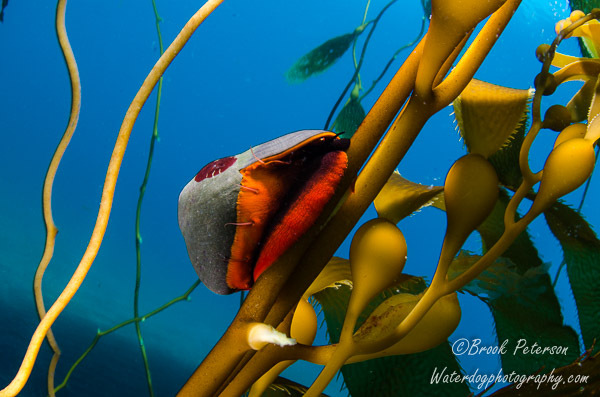 I am thrilled to see all the new life and awed by the creatures great and small living in the waters of the California coast. 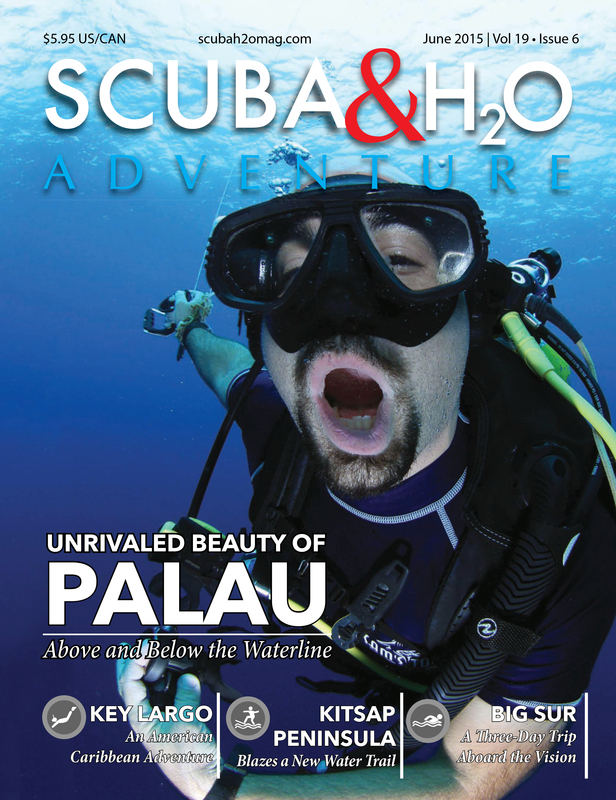 When I was a new scuba diver, everything I saw under the water was new and exciting to me. I wanted so much to share it with others, that I took a snapshot of every creature I saw. 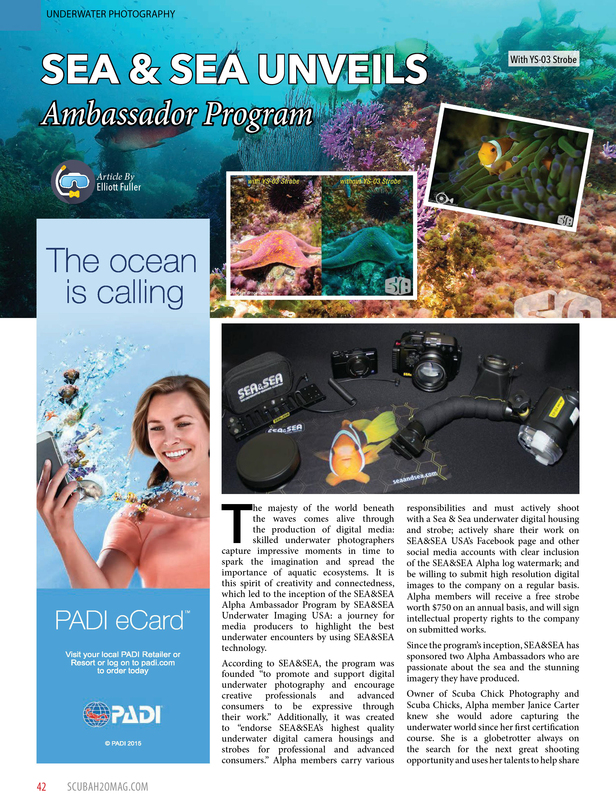 In the beginning, my underwater photographs were like a travel log with a picture ID of each fish, snail and crab. This is very common for new photographers, and if you fall in to this category, don’t be alarmed. It will pass and as your skills improve, you will begin to think about the composition of your images more than the subject your are shooting. The base of every good photograph is composition. Composition is a broad subject to cover in just one post, so here, I will discuss five tips that are easy to learn and fun to practice. The “rule of thirds” is guideline that artists use to make their images pleasing to the human eye. We like to see things off center, usually about a third of the way down or up or to the side. If you divide your image into thirds, the places where the lines intersect are appropriate places for your subject. 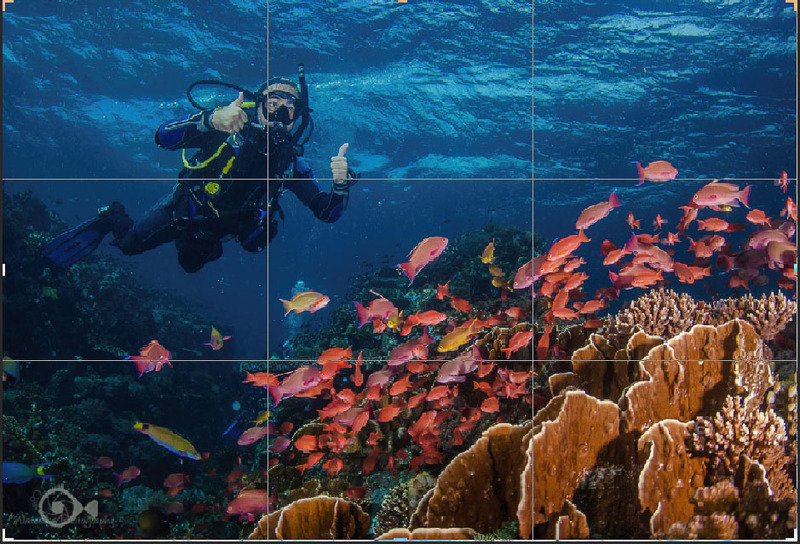 In the image above, you can see that the diver is on one of those intersecting lines, and the fish are opposite, in the spaces surrounding the intersecting lines. This makes the image well balanced from corner to corner. 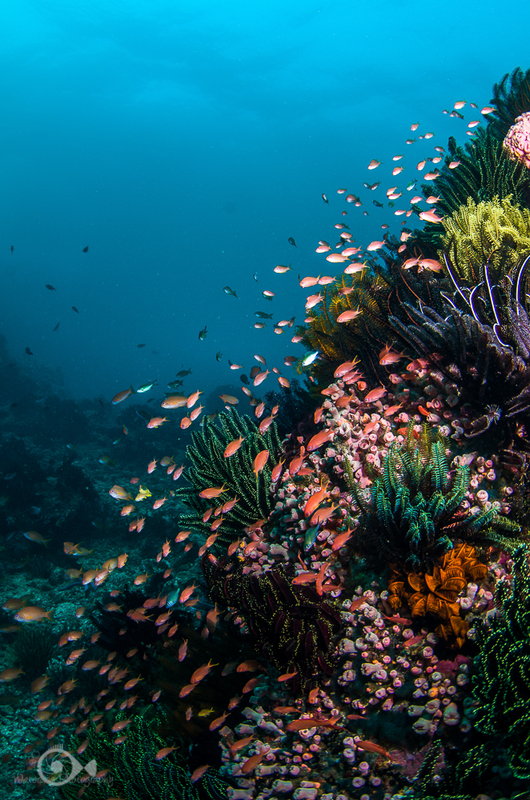 It has the main subject (the fish and reef) taking up the bottom right third of the frame, with the secondary subject (the diver) on the top third. This is one of my favorite compositions. A diagonal composition simply has the subject running from corner to corner. 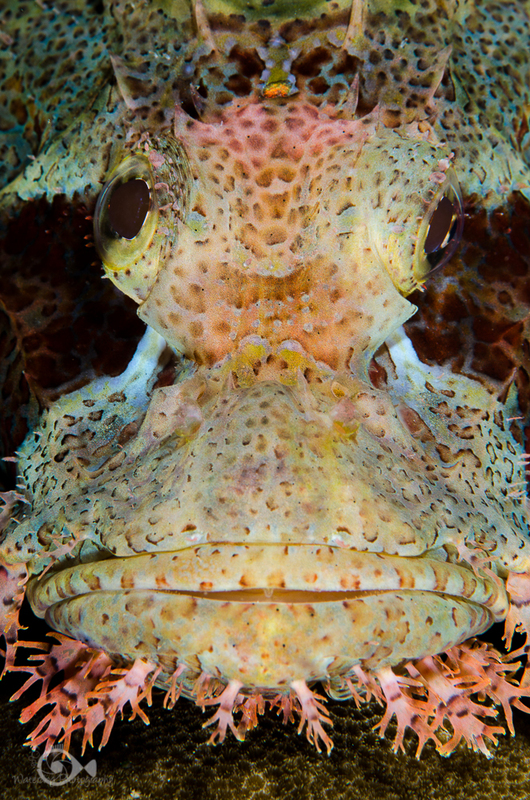 In the image above, the fish’s eyes are on the bottom and right intersecting third of the image, while the fish themselves are on a diagonal. The image below is another example of using diagonal composition. Some of the most interesting images are when the subject completely fills the space. 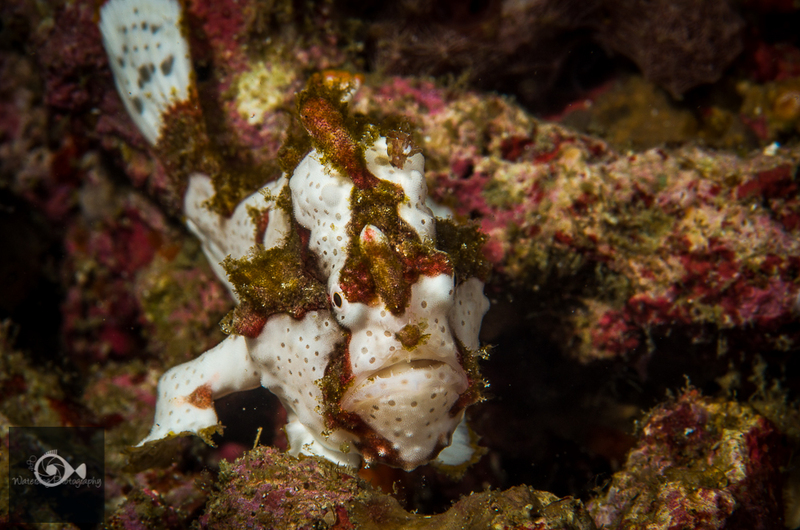 This scorpion fish has very interesting features on it’s face, and by isolating the face in the frame, those features become more prominent. This is a composition that can be a little harder to achieve, but it is something that appears in nature quite often. Look for things that curve in the shape of an “S”, still keeping in mind the other composition rules. 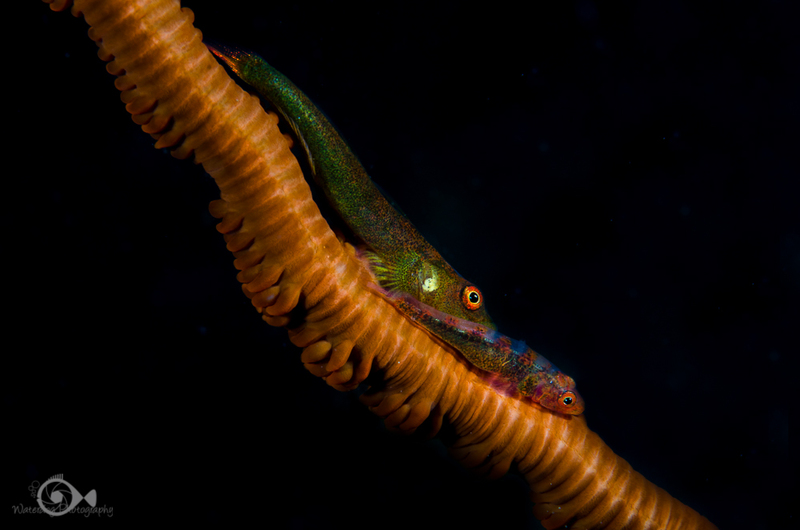 In the image below, the pipefish is somewhat in the shape of an “s,” It is on the diagonal, and the eyes fall on the bottom left intersecting third of the frame. 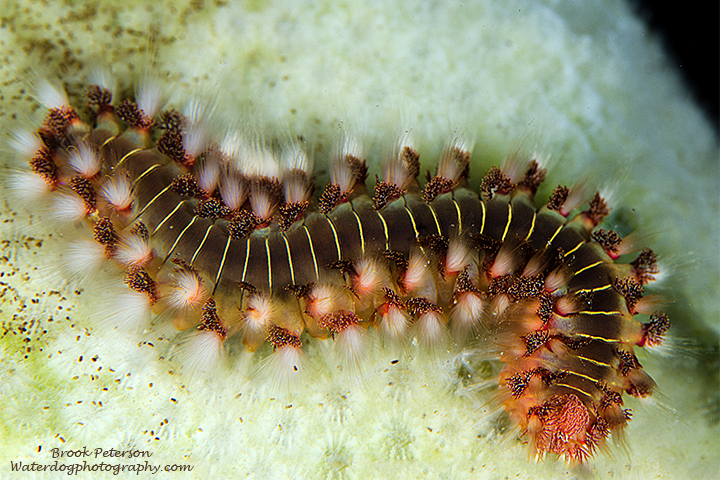 Many critters, such as this fireworm, some nudibranchs, and seahorses have a natural “s” shape to them. You can use that to your advantage when composing your shots. Whatever composition you choose for your subjects, if there is an animal in it, it should have space in the frame to move forward. 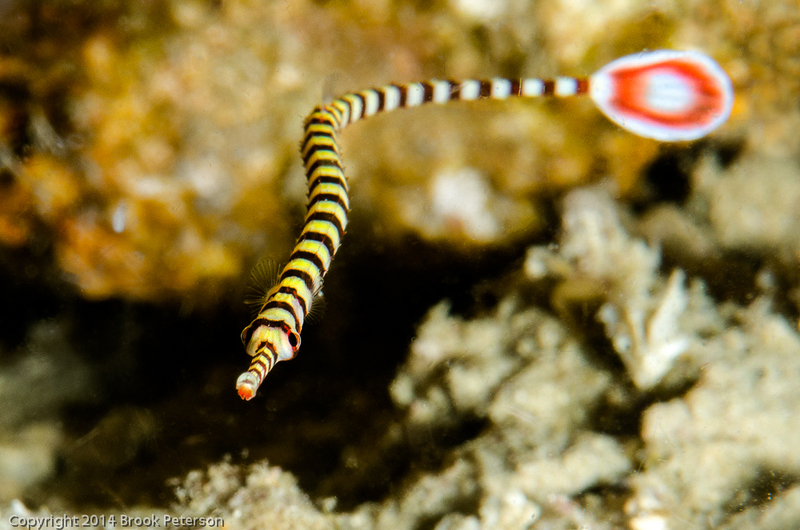 The pipefish above is a good example. There is plenty of space in the frame in front of the fish’s head. 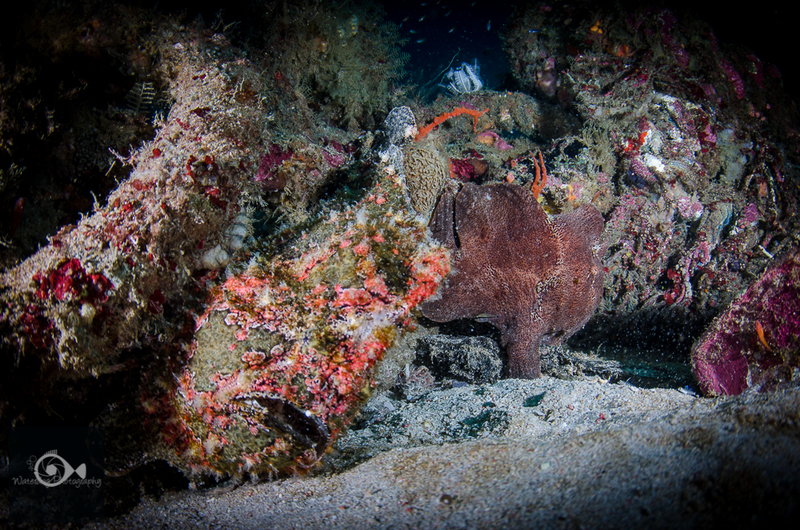 It’s tail has very little space behind it, giving the impression that the fish is moving toward the bottom left corner. 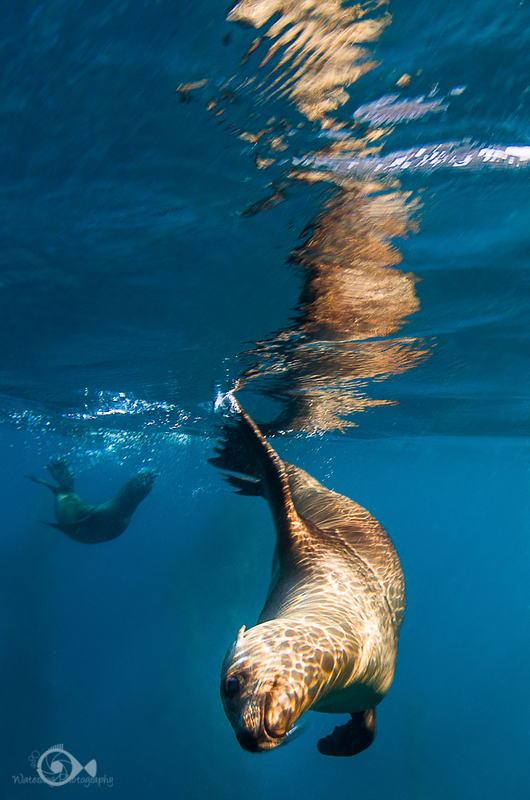 The sea lion image below is an interesting composition because of the reflection, but the sea lion has no place to go and is really too close to the bottom of the frame. An important thing to remember, is that the tips outlined above are not hard and fast rules. They are more like a base; guidelines for things that please the human eye. Following them can help you achieve stunning results, but composition is subjective, and sometimes, breaking the rules yields the most interesting images. Use your imagination! Let yourself be creative and you might just come up with an award winning photograph for thinking outside the box! 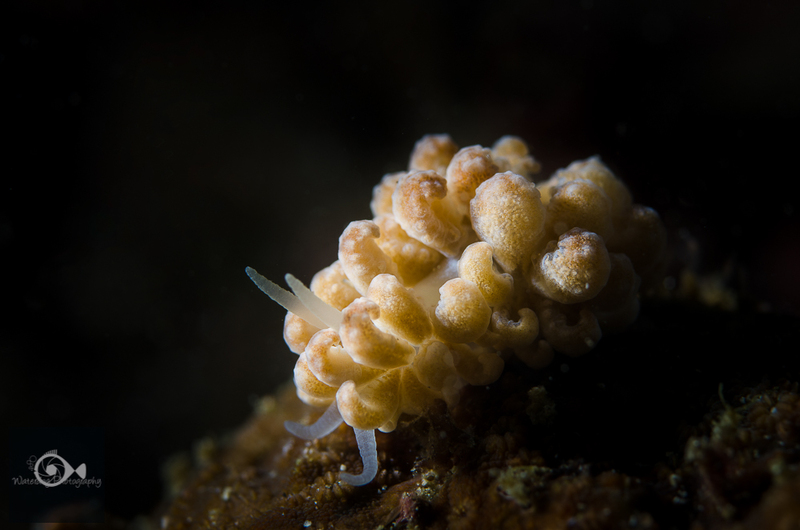 The craziest things in the ocean turn out to be nudibranchs! 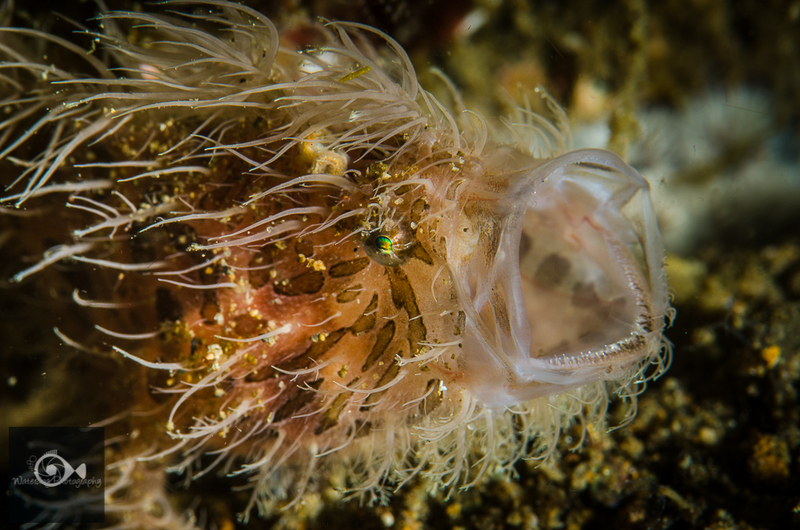 Some of these nudis are so cryptic that they have only recently been discovered. 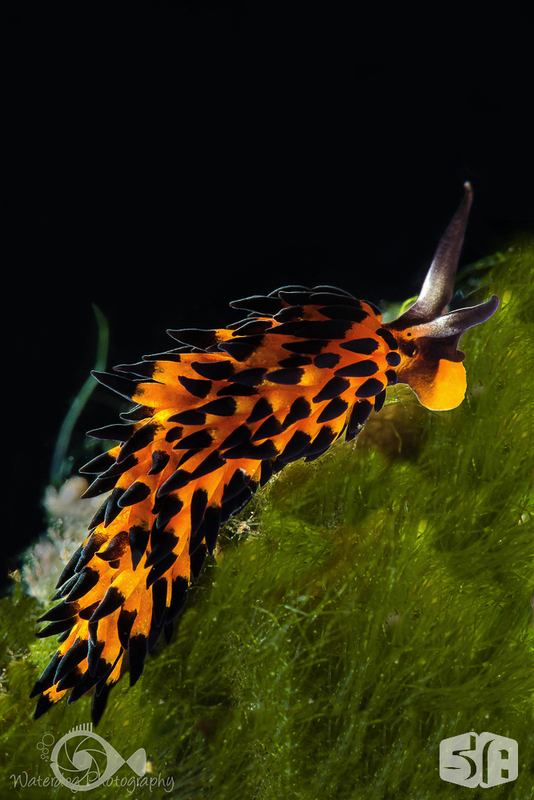 Weirder still, some of these nudibranchs are solar-powered. 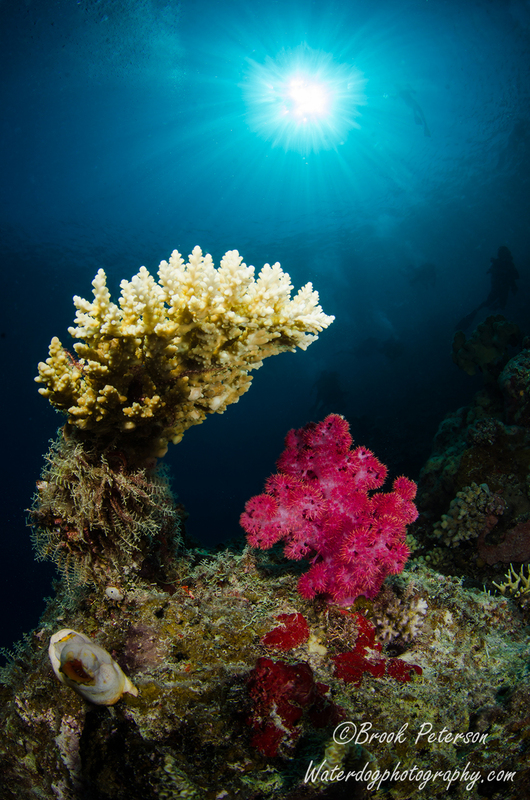 They store algae in their outer tissues and live off of the sugar produced by the algae’s photosynthesis. These nudis are from the Phylodesmium family. 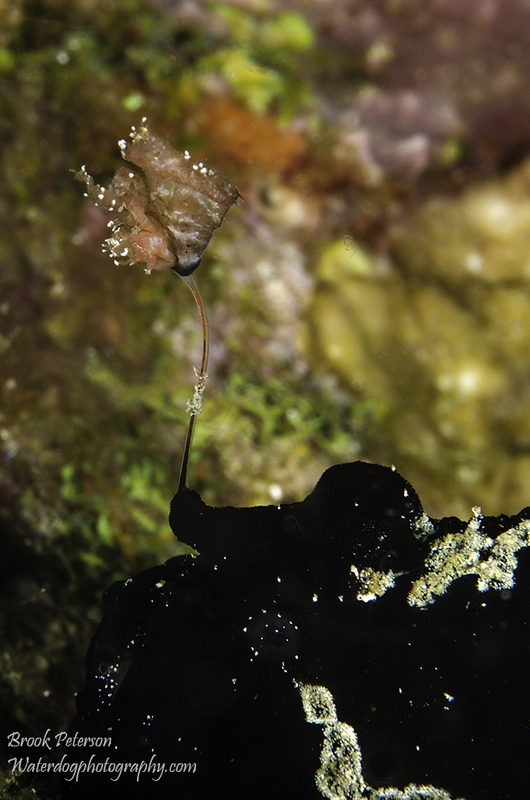 In the images above and below, you can see the digestive glands (the brown clusters) through the translucent white body of these solar-powered nudibranchs. 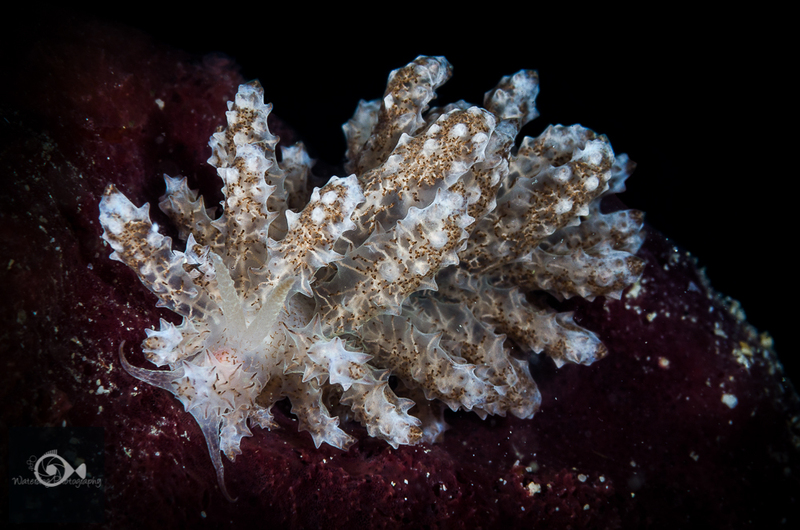 This nudibranch hides in the soft corals that it resembles. Well, more than resembles. 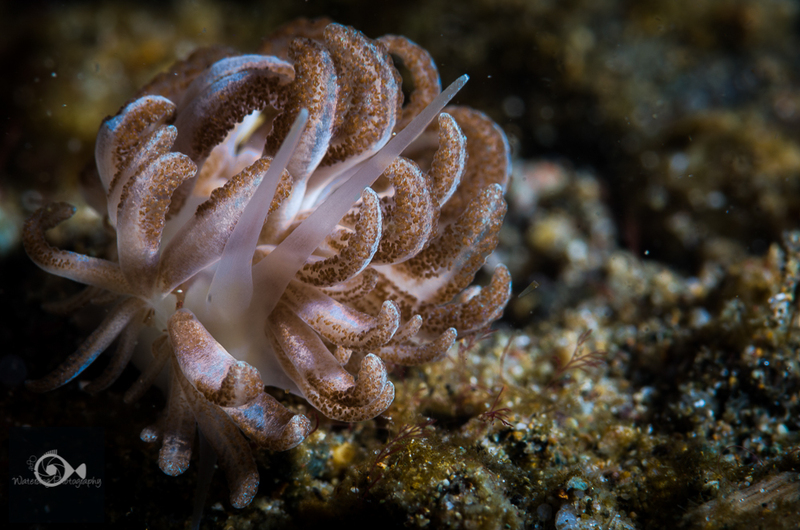 It looks exactly like a soft coral. 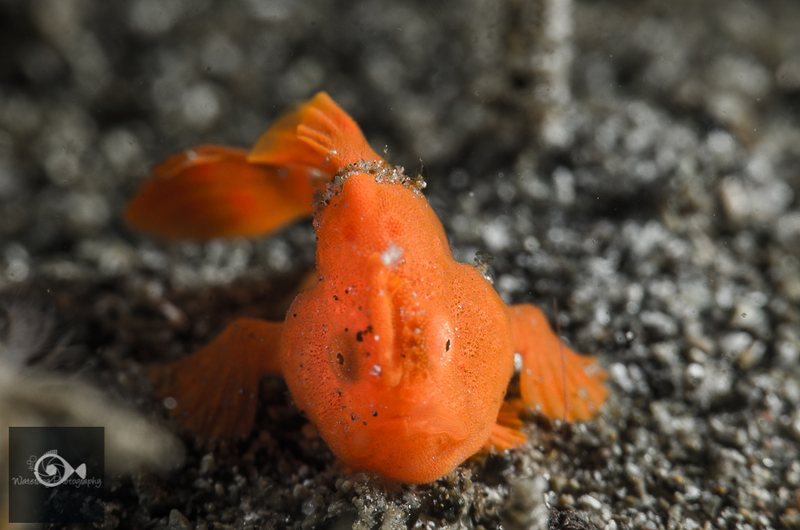 You have to look closely to see it’s head and rhinophores. 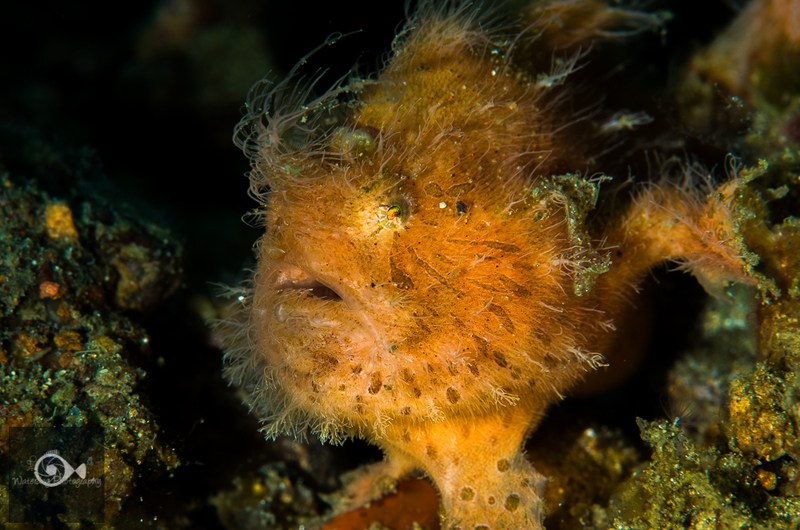 And perhaps the most cryptic of all, Allen’s Ceratosoma, or the Alleni. 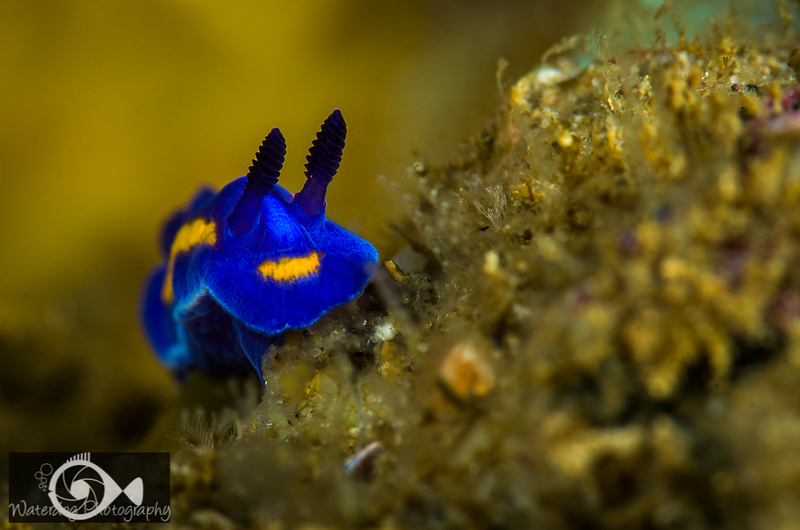 This nudibranch is difficult to find and to some is known as the holy grail of nudibranchs. This particular specimen was about the size of my hand, but I have also seen them as small as my thumb. 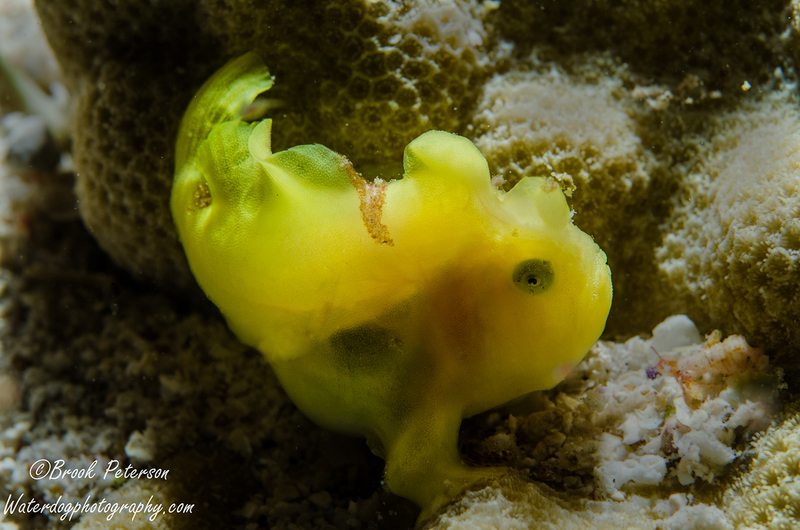 As a photographer, these are the finds that I hope for and the reason I love diving in the Philippines. 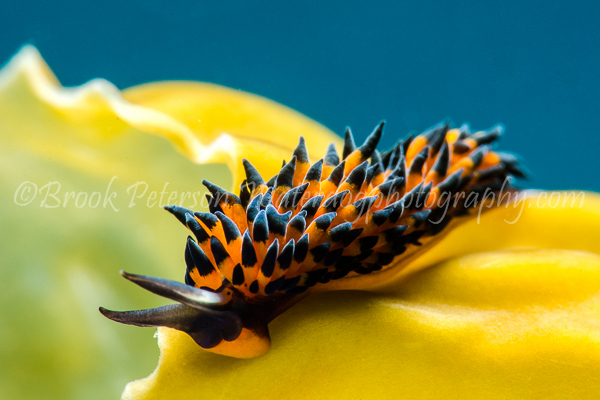 The nudibranchs are plentiful and lovely.